Attention to detail is found both inside and outside this beautiful home. Decorative ceiling treatments and columns are used to visually expand space. The breakfast area welcomes the light from its two walls of windows, and a fireplace accents the great room, which is bordered by two private porches. 1st Floor: 2184 Sq. 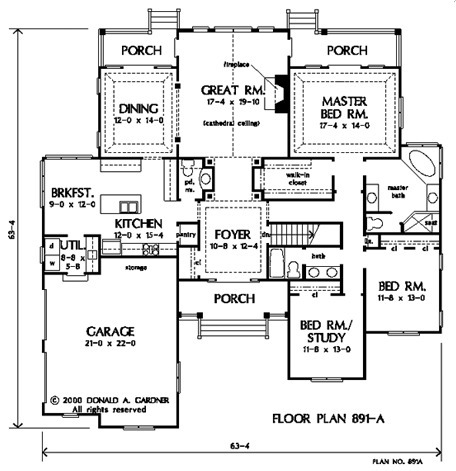 Ft.
House Dimensions: 63' 4" x 63' 4"
Great Room: 17' 4" x 19' 10"
Master Bedroom: 17' 4" x 14' 0"
Foyer (Tray): 10' 8" x 8' 8" x 10' 6"
Great Room (Cathedral): 17' 4" x 19' 10" x 17' 7"
Kitchen : 12' 0" x 15' 4" x 9' 0"
Breakfast Room : 9' 0" x 12' 0" x 9' 0"
Utility Room : 8' 8" x 5' 8" x 9' 0"
Master Bedroom (Tray): 17' 4" x 14' 0" x 10' 6"
Bedroom / Study : 11' 8" x 13' 0" x 9' 0"
Bedroom #3 : 11' 8" x 13' 0" x 9' 0"
Porch - Front : 17' 4" x 6' 2" x 0' 0"
Porch - Rear : 17' 10" x 6' 2" x 0' 0"
Porch - Left : 12' 6" x 6' 2" x 0' 0"
Storage (Other) : 12' 0" x 2' 8" x 0' 0"